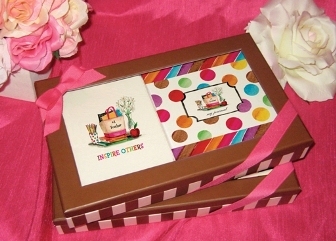 This chic gift box is THE PERFECT gift for a Terrific Teacher! Stylish stationery set includes 8 note cards, 8 envelopes and a coordinating 100 page journal in a beautiful keepsake gift box. All stationery products are printed on recycled paper. Each gift box comes beautifully wrapped with a grosgrain ribbon. 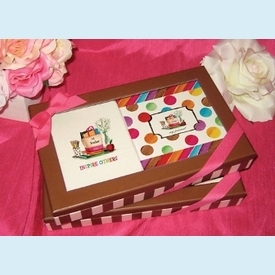 The keepsake box can later be used to store all your stationery! A portion of the proceeds from the sale of this product will be donated to The Breast Cancer Research Foundation and other organizations promoting breast cancer awareness. CLOSEOUT: Only 5 sets left!